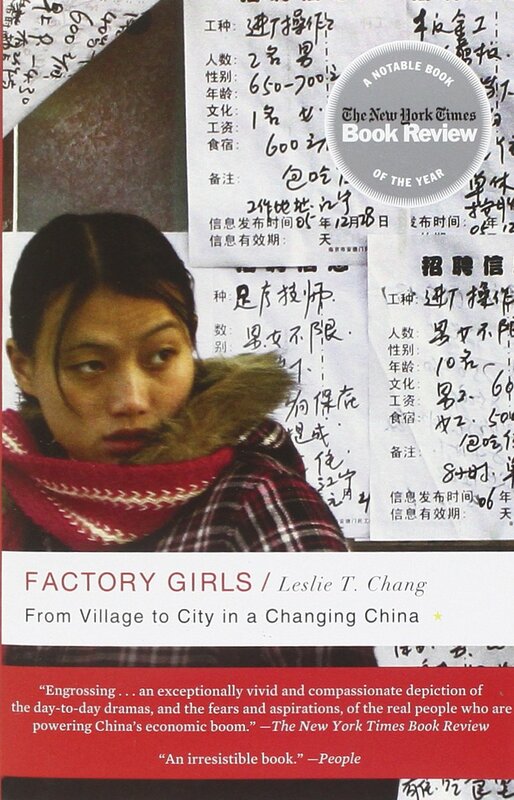 As I began to write this blog post about “Factory Girls:From Village to City in a Changing China” by Leslie T. Chang, I decided to watch her TED Talk, which has been translated into 26 languages and viewed over 1.1 million times across the world. In this video, she discusses what she learned as she investigated the working and living conditions of Dongguan, in the Guangdong Province. A part of the Pearl River Delta on China’s southern coast and near capitalist Hong Kong (which was then controlled by Britain), this city was a part of the first special economic zone that was created in 1979 under President Deng Xiaoping, which eased up economic restrictions and enacted measures to boost Foreign Direct Investment. While the surrounding areas are known for different expertise, Dongguan manufactures 40% of all the magnetic heads used in computers and 30% of all computer disk drives. Moreover, the city has averaged a growth of 15% per year for the last two decades. While many reporters and journalists focus on what is made and in what conditions it is made, Leslie Chang sought to change the focus on who made these products. By focusing on the aggregate and not looking into the experiences of individual workers, Chang suggests that Marx did not paint a true picture of manufacturers or of workers, in general. 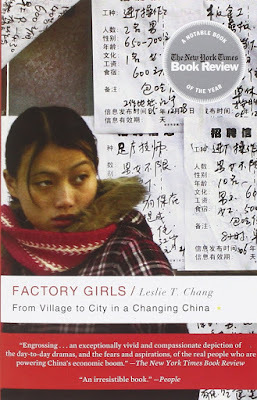 There are an estimated 130 million migrant workers in China and their work in these manufacturing facilities have helped transform their rural villages, as “money sent home by migrants is already the biggest source of wealth accumulation in rural China.” (page 13) Perhaps even more interesting to readers is the fact that a vast number of these migrant workers were women. Not only were they considered easier to control on the factory floor by industrialists, there were many other factors which contributed to women going out into the world to make a living for themselves. One of the biggest factors was the gender and family politics within their traditional, rural areas (where the one-child policy has never been strictly enforced.) Sons were always prized higher than daughters. As women were less treasured and less coddled at home, they were freer to become independent and do what they wanted. My fingers flew across the laptop as I wrote this introduction to my recent Op-Ed about the local political resistance to a church-sponsored refugee resettlement in Spartanburg County (which would later be published by FITS News under the title “The Politicization of Refugees Needs to Stop.”) I had never intended to join the fray. When politicians started to raise concerns (unnecessary concerns, with political undertones – in my opinion), I began to write them letters as a concerned constituent. Spartanburg, one of the most prosperous communities in South Carolina, had a history of accepting refugees. My own grandmother had taught English as Second Language courses to Vietnamese, Laotian, and Cambodian refugees in the 1980s. These people had come to South Carolina knowing little English, often practicing Buddhism, and with a limited understanding of democracy. They adapted to their new surroundings and their children excelled. I even attended Wofford College with the child of one of my grandmother’s pupils! I will make a confession: I had actually purchased this book on my Kindle some years before, but couldn’t even make it through the first chapter. Although the book is incredibly insightful, it is not exactly for the novice on African affairs. (For example, just as “Moscow” and “Washington” are used interchangeably with “the Russian government” and “the United States government”, the reader of this book will need to have the prior knowledge to be able to match Luanda, Kampala, and Kinshasa with their respective countries.) However, after having developed a fairly strong understanding of this region, I devoured this book. The way in which the author describes history is thorough and objective, while still communicating the different interests of the groups involved in the recent conflict in the Great Lakes Region of Africa. The author argues that the first conflict in the series of Africa’s World War was the Rwandan genocide of 1994, in which up to 1 million Tutsis and moderate Hutus were killed by extremist Hutu groups. This conflict spurred the mobilization of up to 2 million refugees, many of whom landed in the DR Congo on the eastern Kivu region, where extremist Hutu militia groups intent on re-entering Rwanda and topple the new government began to mobilize in the same refugee camps of everyday Rwandese civilians. Needless to say, the Rwandan government was thinking about the security of their new nation when they attacked the DR Congo: “The basic cause that led the Rwandese leadership to attack Zaire in September 1996 was the presence of the large, partially militarized refugee camps on its borders. But there was also a broader view, which was a systematic trans-African plan to overthrow the Mobutu regime in Zaire.” (page 67) The trans-African plan incorporated most of the countries of southern Africa, all of which had very negative views of the DR Congo’s dictator Mobutu, who took control of the country in 1965 through a CIA-sponsored coup. This dictator, who renamed himself “Mobutu Sese Seko Nkuku Ngbendu Wa Za Banga” translating to “the all-powerful warrior who, because of his endurance and inflexible will to win, goes from conquest to conquest, leaving fire in his wake,” built a cult of personality around himself. More importantly, sponsored by the United States in the Cold War, he let his country fall behind in development and created enemies out of many of the 1990s African regimes (such as Zimbabwe, South Africa, Namibia, and Angola) because of his sponsorship of CIA-supported maneuvers against their political movements. Core conflict: Rwanda, with Uganda’s assistance, tried to overthrow rebellious puppet Kabila. Second layer: Angola, Zimbabwe, and Namibia did not care about the Hutu-Tutsi conflict, but wanted Kabila to stay in power for their own reasons. Third layer: Libya, Chad, and the Sudan decided to involve themselves in the conflict not because of the issues at hand, but rather because of who else was already engaged in the conflict. Fourth layer: Burundi and the Central African Republic were brought into the conflict, while engaged in other conflicts as peripheral players. 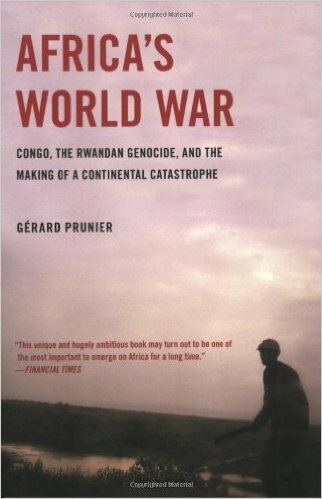 Gerard Prunier described “Africa’s World War” and the following conflicts (some of which even continue to this day) as similar to the Thirty Years War in Europe which took place from 1618-1648. Noting the similarities of these conflicts, he wrote that they occurred “…purely because of the princes’ ambitions, prejudices, and security fears. And the Congo, like Germany in the seventeenth century, was their battlefield. The violence and the meaninglessness were the same.” (page 286) Moreover, he blames the West, their non-governmental organizations (who are only sustainable through prolonged conflict and suffering), and the diplomatic community for not studying this conflict intensely and for forcing it into a western narrative, which really had very little to do with the situation at hand. According to Prunier, “Thus in the Western world and in the diplomatic view, the war against Mobutu appeared as a kind of holy crusade of the new against the old, of virtue against vice, an epic of reformed communists who had seen the light of capitalism and were going to bring free trade and the computer revolution to Africa.” (page 332) Essentially, by not working to understand the conflict, we have enabled the conflict and violence in the DR Congo to perpetuate and eventually lead to the 5.4 million deaths I mentioned at the beginning of this post. “You are from South Carolina?” the taxi driver asked me excitedly. Somewhat shocked to receive this level of enthusiasm about my home state, I gave him an affirmative answer and immediately asked him why his interest in South Carolina. I proceeded telling him all I knew about the Geechee/Gullah people, communities of descendants of African slaves in South Carolina who never fully assimilated to western culture and kept a great deal of their native African cultural influences. I didn’t have a lot of information at my disposal, just tidbits that I remembered from Gullah guests during their visits to my primary school. It was enough information to make him incredibly animated, though. “When my friend’s wife talks, she uses words that we use in Sierra Leone! Can you imagine?” he looked back at me and smiled broadly. This exchange made a strong impact on me. I had just been to the Statehouse in Columbia, South Carolina. Publicized extensively in the mire of controversy, the South Carolina Statehouse became the site of a nationwide debate around the 2000 presidential elections in the United States, due to the refusal to remove the Confederate flag from the Statehouse grounds (albeit, it was finally moved from the dome to a monument.) The year following, there was enough momentum to commission, fund, and build a monument dedicated to African American history on the Statehouse grounds. When I went there, I found the monument very powerful. While the sculpture was breathtaking in and of itself, what really made an impact on me was the depiction of a crowded slave ship, as well as rocks from the original ballasts of the slave ships from Sierra Leone, Ghana, Senegal, and the Congo. I began thinking about how unfair our education system is here in the United States – the histories of our European ancestors are so excellently memorialized in our historical education books, while I doubt most students could even find Sierra Leone or Ghana on a world map. This book is a beautiful read, from beginning to end. 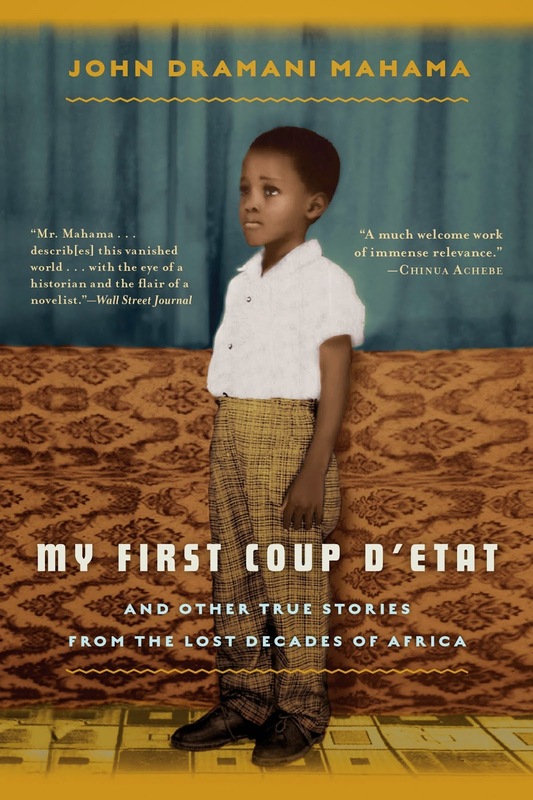 The book delves into Mahama’s childhood and his education, with the backdrop of the chaos of Ghana (and to an extent, all of West Africa) during the 1960s and 1970s. Born into a privileged existence with a father who was first a government minister and then later a successful businessman (before losing his enterprise and going into political exile), Mahama’s story is a unique one. The beginning of his life was spent inside such settings as fancy cars with chauffeurs, his father’s many houses throughout the country, and nice boarding schools. His existence is doubtlessly privileged, but his objective view to his own life makes the book read less like a self-congratulatory ode (that is often characteristic of politicians, regardless of culture) and more of a skilled writer’s eloquent coming-of-age memoir. The first story begins in 1966, with Ghana’s first coup d’état against Kwame Nkrumah, one of the leading intellectuals against British colonialism. The coup occurred as Nkrumah was in North Vietnam on a state visit by Lt. General Emmanuel Kwasi Kotoka (who was killed the following year in another coup.) Although the coup was swift and more or less “bloodless,” it had a profound impact on the young Mahama, who was less than ten years old. His father was imprisoned and detained for his role in the previous government, greatly changing the dynamics, as well as the economic situation of his family. Mahama constantly experienced the government’s encroaching power into his life. One example was during fraudulent elections nationwide, in which he and his classmates tried to protect the ballot boxes located at their local high school in the name of socialism, only to have a truck load of government-sponsored thugs physically beat them. Another example was when he had to help smuggle his father out of the country when his father was requested to return to police for questioning, due to a new political post during Ghana’s so-called “Third Republic.” In the meantime, he studied history and communications, worked as a teacher, lived in Nigeria for a time, and then studied in the Soviet Union at the time of Gorbachev’s glasnost (a time in which he discovered that socialism indeed had its own challenges.) 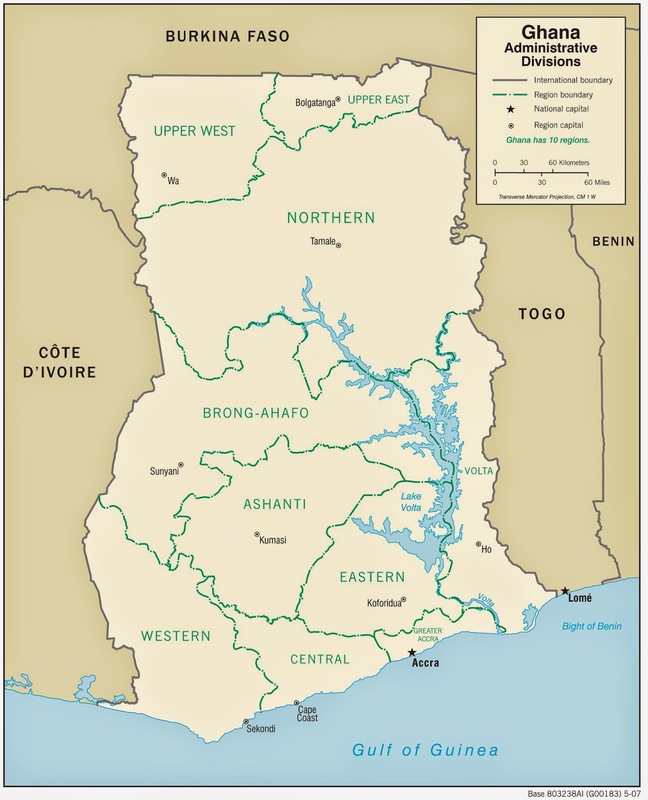 It is a beautiful and full narrative and ends with an encouraging view about Africa: “In 1992, Ghana adopted a new constitution and entered into an era of democracy and constitutional governance.” (page 312) Indeed, nowadays, Ghana is viewed with admiration for its growing economy and free press.